Thank you and congratulations on your purchase of the The Omega Concern's Dual Sig Sauer P229 handgun set. This set is designed to allow the user to use it in a combat or role-play setting and look good while doing so, and is designed for seamless compatibility with the Omega Combat System, the premier combat simulation system in Second Life. Please read this manual before using your new handguns. THERE IS A TECHNICAL SUPPORT PASSPHRASE IN THIS MANUAL, WHICH YOU MUST USE WHEN FIRST CONTACTING YOUR TECHNICAL CONTACT ABOUT THIS PRODUCT. We just do this to make sure you've read the instructions so that we can assist people with truly vexing problems not already answered within. These handguns can be abused and used to annoy and harass others. Don't do that. By purchasing and using them, you agree to use them with willing and consenting participants. No other application is intended or endorsed. 1.2 Added: NP Push and NP PushObj ammo; 'LG' models, 50% larger handguns for you giants out there. Changed: Now using weighted off-axis selection algorithm for more precise non-physical bullet targeting. 1.3 Added: New Rounds: OCS Tracer, OCS Damage, Push, Push Tracer, NP Damage. New Animation Suite - Single Pistol animations. Gesture/Chat Commands. New user configurable velocity system. Changed: New holsters, sound effects completely remixed and updated. NP Destabil reworked and tweaked for additional lethality. Dual pistol animations completely reworked. The P229's come with both a 'regular' scale model set, and a 'large' model set (for bigger than average avatars.) Only one version needs to be worn. Also, the holsters come with a 'Strap' and 'No Strap' version. If you don't feel like sizing the holsters, or if you don't care for the straps, the 'NoStrap' version should be worn. P229 HUD: By default, this Heads Up Display attaches to the center screen point, but it may be attached anywhere on the screen. Note: The guns will not function with only the Left SIG P229 attached. The handgun set will auto-detect when you are using single or dual mode. When detaching the left pistol and leaving the right for single mode operation, it may take the system a few seconds to register that the left gun has been detached. Right Holster SIG P229 1.3/ Right Holster SIG P229 NoStrap 1.3: Either version you choose to use will attach to your Right Upper Leg attachment point. While you may attach it to another point, keep in mind that the animations work with the assumptioni that it is attached there. You are encouraged but not required to use a holster with your SIG P229 system. Left Holster SIG P2291.3/Left Hoster SIG P229 NoStrap 1.3: Either version you choose to use will attach to your Left Upper Leg attachment point. While you may attach it to another point, keep in mind that the animations work with the assumptioni that it is attached there. Optimally, you should wear a Left Sigg P229 1.3 or a Left SIG P229 1.3 LG when wearing a Left Holster. This is suggested, but not required. Main Display: This is the default display, which allows you to perform all operations with the gun set. 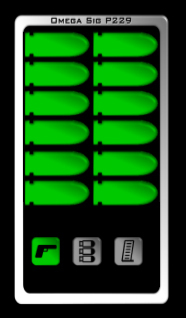 Color Chooser: This is the display shown when you are choosing a color for the laser/sight dots, holster or trim. If you are comfortable editing, you may edit the linked parts of the color palette, and set your own color by setting the color of the entire button to that which you desire. The color that the button is is the color that is sent to the gun set. 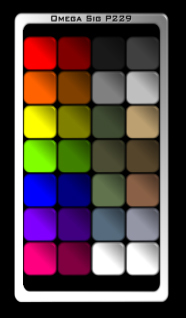 This allows you to save your favourite colors on the palette. Ammo Display: A graphical mode for easy reference to how much ammo you have in the current clip. 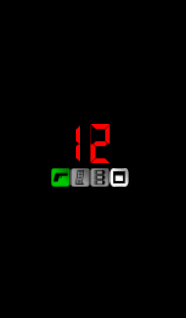 This display can be shown by clicking the HUD frame from the main display. To get back to the main display, click the frame again. 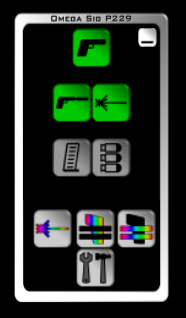 Do note that the guns fire in unison, so if the display shows you have 6 rounds left, that means 6 rounds in each gun. Minimized Display: This is to neatly tuck the display out of the way, giving you a numeric display of the rounds remaining in your current clip, and the ability to draw the weapons, reload, and change ammo. Options Menu: The options menu will give you a blue drop down menu which will allow you to tweak the velocity of your bullets, and to toggle Shell Ejection on and off. For those of you wishing to use the SIG P229's for a combat system other than OCS, tweaking the velocity of your bullets may result in more damage. However, The Omega Concern guarantees compatibility only with OCS and the Second Life damage model. In OCS mode, the selection of ammunition is limited to a pre-selected list of OCS-compatible ammunition. As a general rule, all bullets described as "physical" may be stopped by shields or deflected by interceptors. Push ammunition will work only in non-push-restricted areas. All of the NP rounds now use our newly developed weighted off-axis selection algorithm. This causes the bullet while travelling forward to give preference to targets on or nearest its forward axis, and to a lesser degree, targets that are closer to its position. Closer targets that are more off-axis than a further target receive less "weight" and are not chosen unless the distance between the two is great enough to weight that target more than the on-axis one. This does result in moving targets being a bit harder to hit, but it also allows for much greater target discrimination. Besides, it makes it more like the real thing. 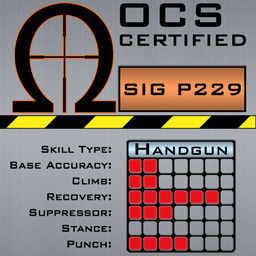 OCS 229: These rounds will be loaded by default when in an OCS Enabled area, when you are wearing your OCS HUD. These rounds inflict traumatic damage on their target. Accuracy will be dependent on your OCS level and skill set. OCS TRC 229: These rounds are indentical to the OCS 229 round, but will utilize a Tracer Bullet. Again, accuracy will be dependent on your OCS level and skill set. DMG 229: Delivers a fatal blow in damage-enabled areas to the unlucky avatar it makes impact with, harmless in non-damage areas. DMG-TRC 229: Same effect as the damage round above, but with a tracer effect. NP PSHO:A non-physical shield-breaking bullet which delivers a strong push in the direction of travel to physical objects. NP DMG: A non-physical shield-breaking bullet which delivers 100% damage to an avatar in damage-enabled combat areas. Note, these rounds will not 'push' your target, and are designed for use within damage enabled areas of Second Life. SMOKE: Bursts Omega Orange smoke upon impact with objects, land, friends or opponents alike. Blinding and annoying to those with particles on, otherwise harmless. GRAV: Upon impact with an avatar, causes them to undergo complete gravitational reversal, sending them high into the sky and out of your face. Works in no-push zones. PSH 229: Similar to NP PUSH above, but will not by pass shields or other objects. Will most likely be fatal in damage enabled areas. PSH-TRC 229: Indentical to PUSH 229 except utilizes a 'Tracer' bullet. NUKE: The Omega Concern's infamous nuclear warheads, compressed with exclusive Shoehorn(tm) technology into .357 sized rounds. Explodes on contact, kills in a 96m radius in damage-enabled areas, and makes for pretty, though harmless effects in others. FLARE: Launches a pair of harmless flares 20 meters above the point of impact to illuminate the subject. Included in the gun kit is a set of gestures bound to F-keys. These gestures simply send the given command to the guns on channel 24, so you don't have to click the buttons on the HUD itself. You DO need to keep the HUD on, however, as it is what parses the commands as they come in. Also, you may say commands directly on channel 24, for example typing "/24 draw" would draw the handgun(s). Q: Will the SIG P229s work with my Roleplay Combat System? A: They may. To date, we have not heard of any systems that the SIG P229's will not work with. However, The Omega Concern does not guarentee compatibility with any other system but OCS and the Second Life damage model. Q: Why do I seem to miss with my SIG P229s in OCS? In short, these guns are meant to deliver devastating fun, and work as a strong statement of your excellent taste for wielding a quality Omega Concern product. The Omega Concern promises to support your P229s for the lifetime of the product, with free upgrades for all of 1.x, and lifetime bug fixes. The Schweizerische Industrie Gesellschaft (SIG)-Sauer P226 is a full-sized, service type pistol originally chambered for 9 mm Luger. Its design is based on the venerable SIG-Sauer P220. The P226 has come to be known as one of the most distinguished combat pistols in existence because of its reliability and durability. The P226 was designed for entry into the XM9 Service Pistol Trials, which were held by the US Army in 1984 on behalf of the US armed forces to find a replacement for the M1911A1. Only the Beretta 92F and the P226 satisfactorily completed the trials; however, Beretta was ultimately awarded the contract for the 92F due to overall cost. The SIG P229 is a compact firearm, often used for concealed carry purposes. The standard version features a DA/SA trigger, but it is also available with a DAO trigger. Recently, the pistol has also been made available in a DAK (Double Action Kellerman) model, which is a DAO system with two trigger reset points, and a lighter, smoother pull than that of traditional DAO handguns. The P229 differs from its cousin, the P226 in several respects. The P226 is a "full size" pistol, while the P229 is considered compact. The P226 originally was manufactured using a stamped-steel slide on an aluminum alloy frame. The P229 consists of a milled stainless steel slide, typically colored black with a Nitron finish. The P226 and P229 are both available with optional accessory rails and optional forged stainless steel frames. The P229 can be chambered in 9 mm, .40 S&W or .357 SIG. Changing between .40 S&W and .357 SIG is as simple as switching out the barrel. Conversion barrels, from companies such as [Bar-Sto Precision Machine], will also allow your P229 or P226 to change between a .40 S&W/.357 SIG to a 9mm caliber. The magazine can accommodate ammunition of either caliber. The 9 mm model cannot be converted to another caliber. SIG firearms are manufactured both in Germany and in Exeter, New Hampshire. Although Schweizerische Industrie Gesellschaft is a Swiss company, Swiss law is highly restrictive when it comes to the export of firearms. Consequently, SIG entered into an agreement with German gun manufacturer J.P. Sauer & Sohn to facilitate an export market for their products.